News of Bandhan Bank Ltd’s purchase of Gruh Finance Ltd sent the former’s shares crashing over 6% on Monday. From Bandhan Bank’s perspective, the merger share swap ratio of 2.84:5 is slightly better than what news reports had suggested. The dilution in its equity will be about 1.5% lower compared to a scenario where the share swap ratio was set at 3:5, which isn’t much to celebrate. Investors are seeing this as a desperate attempt by Bandhan Bank to reduce its promoters’ stake and meet the Reserve Bank of India’s (RBI’s) shareholding norms. If the deal materializes, Bandhan Bank’s promoters will own 61% in the bank, down from 82.3% currently. It still needs to do more to reduce promoter holding to 40%, to meet RBI’s rules. This is particularly worrisome because coming to the halfway mark of the target has itself been an extremely expensive affair. 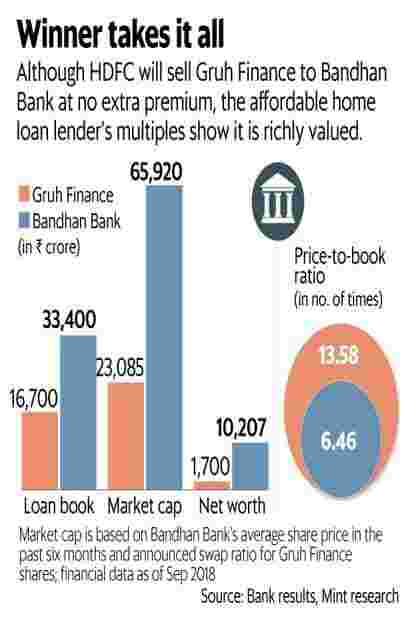 For the deal, Gruh Finance has been valued at an exorbitant valuation of 13.6 times its net worth as on September 2018, while Bandhan Bank’s price-book valuation was pegged at less than half those levels at 6.45 times. This isn’t very far from the average share price of the two companies in the past six months. Ironically, one of the reasons Gruh Finance enjoys such a high valuation is on account of its parentage. Housing Development Finance Corp. Ltd (HDFC) owns 57.8% in the company. With the deal, Gruh Finance will actually lose this exalted status; although Bandhan Bank has ended up buying the whole company at high valuations. HDFC, on the other hand, gets to sell its stake at a premium valuation. The actual monetization may happen at a later stage, although the share swap ratio ensures it has got itself a sweet deal. In fact, this gives it the best of both worlds, since it can freely pursue the low-income segment without worrying about overlaps with subsidiary, Gruh Finance. HDFC said that 18% of its lending in the first half of this year has been towards the low-income group and economically-weak sections of society, where the loan value is between ₹ 8 lakh and ₹ 10 lakh. But it is not all thorns for Bandhan Bank. The lender is keen to grow its non-microloan book and what better way to do than grow low-risk housing loans. The merged entity would have the twin coveted markets of microloans and affordable housing loans. And Gruh Finance has been reporting a reasonably strong performance. In the September quarter, the lender reported a neat 20% increase in profits and 18% growth in disbursements. It has the lowest proportion of developer loans, currently the pain point for housing finance companies. The stock has steadily risen and even managed to largely escape the meltdown in financial stocks during September. And if the move helps Bandhan Bank get some leeway from the regulator, it may get some freedom to open new branches. That said, the Bandhan-Gruh Finance deal alone is not enough to meet norms. The fact that Bandhan Bank promoters need to lower their stake further, coupled with a possible stake sale by HDFC, may act as an overhang on the stock.